Recently I wrote a couple of posts about Rachel Corrie (here and here). I was particularly interested in what prompted her to go to Gaza with the International Solidarity Movement [ISM], a group which sends idealistic young Westerners to serve as human shields for Hamas or PLO guerrillas in the front lines of the low-intensity Arab war against the Jewish state. A few of these ‘internationals’ have been seriously hurt, or, like Corrie, killed, sacrifices on the altar of anti-Israel propaganda. How does it happen that young people are prepared to risk everything for a cause which, by any logic, is not theirs; and which, as causes go, is not especially pressing (the Palestinian Arabs in Gaza or Judea/Samaria are better off in every way than Palestinians in Lebanon, Copts in Egypt, Sunnis in Syria, etc.)? The answer is that there are well-tuned systems set up on many of our campuses which recruit, process and send students off in service of the Palestinian Cause. These machines have a permanent nucleus of a few dedicated faculty members, which is orbited closely by student organizations like Students for Justice in Palestine, the Muslim Student Association, Jewish Voice for Peace, and more. There are also peripheral groups that support the projects of the central players, usually because of a perception of shared ‘colonial oppression’ — this sometimes includes LGBT groups, immigrants’ rights organizations, etc. Students drawn into these psycho-political cyclotrons are insulated from all other voices, and what begins as a concern for human rights is amplified by contact with more and more extreme expressions of anti-Israel ideology until they fly off, completely one-dimensional, often white-hot with hatred for the Jewish ‘colonialists’, prepared to cooperate if need be with murderous terrorists because of their perception of the overwhelming justice and need of their Cause. 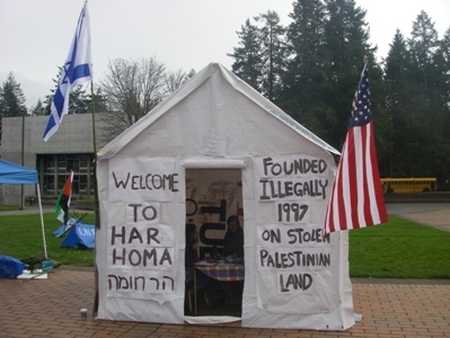 The Evergreen State College [TESC] of Olympia, Washington, where Rachel Corrie was recruited, has provided a disproportionate number of ISM volunteers. As I wrote before, faculty members Steve Niva and (former faculty) Simona Sharoni were mentioned several times in Corrie’s diaries as important influences on her decision to go to Gaza. If we look at the overall environment of Evergreen, perhaps we can understand the way today’s Corries are submerged in the Palestinian narrative and Israel-hating ideology. A student group called “TESC Divest!” — which, for some reason does not appear in the list of official student organizations on TESC’s website — is the center of several boycott-divestment-sanctions [BDS] projects, as well as various “informational” activities and events. Evergreen State College is a total immersion experience — immersion in anti-Israel propaganda. This entry was posted on Sunday, September 9th, 2012 at 9:30 pm and is filed under Academia. You can follow any responses to this entry through the RSS 2.0 feed. Both comments and pings are currently closed.